We’d like to welcome a new co-host to the Ask Different Podcast, Mike Bradshaw! Mike is the #1 user on Ask Different by reputation, and worked in an Apple Store for 4 1/2 years. Thanks for being on the show, Mike! After we open with talking pleasantly about weather and recount the amount of time we’ve now been doing this show, we discuss the state of iOS 5’s Notification Center and apps that don’t seem to play nice with it. And speaking of not playing nice, Facebook’s iOS app. After our round of kvetching concludes, we talk a bit about Facebook’s direction, what demographics may be most beneficial, and who they have in mind with new features. This is the thirteenth episode of the Ask Different Podcast. Your hosts this week are Kyle Cronin, Jason Salaz, and Nathan Greenstein. We’d like to welcome our special guest, Stack Exchange’s Valued Associate #36, and member of the MAYHEM CHAOS team, Abby Miller! The CHAOS team’s “Raison d’être” is community engagement and promotion, both on Stack Exchange sites and external to them. 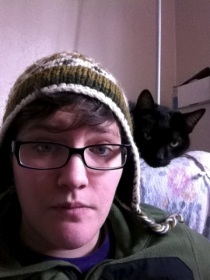 The first site Abby managed as part of CHAOS is Ask Different, and she’s now begun working with Game Development. In addition to the metrics that Stack Exchange provides for each site, the CHAOS team has taken site quality research to task. They compared Stack Exchange sites to other sites covering similar topics, to guage a visitor’s ability to start with a Google search and end up with their question answered as quickly as possible. Ask Different, for example, was compared against Apple’s Support Communities. In the early days of the CHAOS team’s involvement on Stack Exchange, a major task was to spruce up the quality of content on selected sites. They started by going through top questions and fixing up spelling and grammar, focusing on ensuring that question titles were formed as a question and not something more like an e-mail subject. We discuss an interesting situation that the Stack Exchange network creates, in that Stack Exchange maintains, designs, and hosts the sites, but lays no claim to any of the content that the users create, which is very unusual for a profit-seeking company. The virtues of community-driven and community-maintained sites is a staple of Stack Exchange’s philosophy. This is the twelfth episode of the Ask Different Podcast. Your hosts this week are Kyle Cronin, Jason Salaz, and Nathan Greenstein. We have been featured on the Stack Exchange Podcast, Episode #16. We recorded a short 30 second ad that Stack Exchange offered to air. You can listen to the entire episode, and note Kyle’s comment listing our ad’s air time, at Episode #16 on Soundcloud. Additionally, Ask Different wants to be part of Blog Overflow! We’re looking for dedicated, dependable users able to write regularly on topics you are interested in. If you would like to be part of a team of writers, we invite you to post some details about your ideal topic(s) on the meta post on Ask Different. Our guest today is the Stack Exchange designer-in-residence: Jin Yang! We start by asking Jin how he came to be employed by Stack Exchange. Even though he knew Jeff already, he had to work hard to get the job. The first work he did for Stack Exchange. His debut was Area 51, which he created in one night! Next came Super User, and then the Stack Exchange 2.0 sites. Today, he’s designed 27 sites! Next, Jin goes over his design process, and we ask him about his experience designing Ask Different. He started by asking fellow designer Mike Rundle for a mockup. Jin liked it and started making some tweaks. He soon realized that it took a lot of extra CSS to make the design work. We appreciate the extra effort he put into our site! We also discuss a recent blog post by Mike Rundle about designers who can code. Jin tells us that he used to program, using ColdFusion and ASP/ASP.NET, though his work with Stack Exchange is dedicated as a Graphic Designer. We briefly talk about the visual evolution of Apple-branding that has occurred since the official launch of Ask Different, and whether or not certain Apple style changes should make their way to Ask Different in some form. As previously covered, we discuss the traffic-bump as a result of an Ask Different ad being placed on Daring Fireball, and how Stack Exchange could be improved to display better user referral metrics for site moderators to view. This brings us to note how the growth of Stack Exchange has led to many additional sources needing uniquely designed graphic work. In additional to all of the website work Jin does, he’s also begun designing logos and layouts for T-shirts, business cards, and promotional fliers. If you view Jin’s Twitter Profile, his biography includes the words “Professional bacon eater”. The discussion of bacon leads to Reddit, as Kyle and Jin discuss Reddit inside jokes, and the Alien Blue iOS app for Reddit. Jin explains more about community design involvement and other details that go into creating a Stack Exchange logo and site design. This leads to a discussion of how the design should fit into the language and culture Stack Exchange sites, such as English, Japanese, French, and Jewish Life & Learning among others. Since employment, Jin has not done every single site. He discusses his reasoning for contracting out the work to Alex Charchar for the English Stack Exchange site, and Dmitry Fadeyev for UX Stack Exchange. Though not covered on the show, note also that the design Ask Ubuntu was done by a graphic artist within Canonical, Ubuntu’s controlling company. We briefly discuss the Area 51 proposal process, how it could be intimidating to non-technical users, and how that may prevent some of the best ‘civilian’ proposals from becoming available on Stack Exchange’s network. Thanks so much to Jin for appearing on the show! You can find Jin on Twitter and his blog. This episode was recorded on September 9, 2011. You can subscribe to this podcast via RSS or iTunes. We’d love to hear from you! Please feel free to leave a comment on this post or e-mail us at podcast@askdifferent.net. This is the eleventh episode of the Ask Different Podcast. Your hosts are, as always, Kyle Cronin, Jason Salaz, Nathan Greenstein. We have a special guest today: Long time Apple user, speaker, and author Tom Negrino! Tom was introduced to Macs by accident. He got a Macintosh after seeing the 1984 commercial, and has been using them ever since. He tells the story of how Macs have factored into his life over the years. Tom has been a professional writer for more than 20 years. He tells us how he accidentally started writing, and how that’s lead him to where he is today, with more than 40 books published. Out of us four, Tom is the only one who has been using Macs since before OS X. When asked what he misses from those days, he tells us that “OS X is so much better than the original system that there’s really no comparison.” He shares some of the things that have been drastically improved (or added altogether) with OS X.
That’s not to say, however, that that era didn’t have its share of great hardware. Tom’s SE/30 remained in use from 1987 to 2002! Amazing for its time, that machine had an expansion slot (for a color monitor) in addition to a 9” grayscale screen. This leads us to discuss Apple’s masterful use of clean, monochrome displays. Tom explains how he initially learned of Ask Different during MacWorld Expo 2011. Tom had only recently learned of Ask Different after his wife, Dori, had a business meeting at MacWorld with Stack Exchange’s own Jeff Atwood back while she was a Moderator Pro Tempore. We touch on Tom’s opinions of the Stack Exchange engine and it’s various sites, which draws the inevitable comparison to other networks such as Yahoo! Answers, and just how dramatically different the content and demeanor of the sites are. Kyle explains his theory about this difference in intent by referencing the broken windows theory, explaining that people answer with shock value on Yahoo! Answers, but answer with quality on Stack Exchange, due to the quality of both questions and answers already on the site. Tom and Dori both recently attended WorldCon 2011 / Renovation both personally and also to help promote Stack Exchange and their Science Fiction and Fantasy site and Writers StackExchange as well. We talk about the attendee experience, such as one of Tom’s favorite costumes, specific qualities present in Las Vegas conventions based out of a hotel and casino, and some of Tom’s experience speaking on Renovation panels. If you’re interested in science fiction, Tom recommends the podcast The Incomparable. This turns us to talking about the tech, both hardware and software, used by writers not only for the literal act of writing the content, but also the choice of software and operating system used for various application screenshots. Tom mentions that he could not live, professionally speaking, without Dragon Dictate and OmniOutliner. We discuss the state of OS X with regard to the numerous methods of installing and updating your third-party software. What works, what doesn’t, and what gets in your way. With particular reference to the completely trivial upgrade methods employed by Panic for their software such as Coda, but also the completely different flow used by apps listed in the Mac App Store. Currently, Tom has a single computer upgraded to Lion, and another one still remaining on Snow Leopard. We talk about early adoption habits past and preset, beyond OS updates, also covering the release of the original iPod, the more recent release of each iPhone, and the iPad. We contrast the decade-long evolution of the original iPod to the current generation iOS devices, to the drastic changes that Lion suddenly brought us with regard to Natural/Momentum Scrolling, Reverse Scrolling, Hidden Scrollbars, the revamps to spaces found in Mission Control, and more. Tom has many of the same opinions that Chris Breen detailed in an opinion piece he wrote for MacWorld. And finally, we talk about the biggest headline of the week, the resignation of Steve Jobs as CEO. We explain the fundamental changes this brought, and the details that speak to the amount of trust placed in the new CEO Tim Cook. We talk about much of the coverage that we’ve seen since that announcement on Wednesday, including Tom’s suggested read; Glenn Fleishman’s article on how Apple has personally affected his life, and the lives of so many others. This episode was recorded on August 27, 2011. You can subscribe to this podcast via RSS or iTunes. We’d love to hear from you! Please feel free to leave a comment on this post or e-mail us at podcast@askdifferent.net. This is the tenth episode of the Ask Different Podcast. Your hosts this week are Kyle Cronin, Jason Salaz, and Nathan Greenstein. On August 17, we celebrated Ask Different’s first birthday! On that date in 2010, Ask Different entered private beta. Since then we’ve seen tremendous growth, exceeding all our expectations. We’d like to give a big thanks to all of our supporters, users, and everyone else who’s helped make the site what it is. We’ve celebrated this and have more details in the the birthday meta post! This leads us to a discussion of moderating Ask Different. We talk about how the Stack Exchange engine makes it easy to keep a site clean while being friendly towards users. We’d like to thank all of our users who flag posts as well as encourage everyone to click flag if they see something in need of attention. We couldn’t do it without you! We also briefly discuss the concept of Community Wiki posts, and the recent movement to get rid of CW-style posts across Stack Exchange. While we sympathize with this point of view, we feel that there are certain types of expression that are very valuable to the community even though they don’t exactly fit the Q&A format. We cite as an example our Question of the Week from last week; “What tiny thing in Lion makes you smile or has caught you off-guard?“. We discuss why we think this is a worthwhile post to have on our site, but we also acknowledge the times when Community Wiki hasn’t worked. Please be aware that Community Wiki questions have their place, but their place is sparsely present. We bring you a public service announcement: Ask Different will be participating in a beta testing service! Stack Exchange will be running a service that matches developers from the community with testers from the community, including Ask Different users. All the details and forms to fill out to sign up are on Abby’s Meta Post. Moving on to tech news, this has been an exciting week! For starters, Google is going to acquire Motorola Mobility. We predict the implications of the sole developer of Android also being a major handset manufacturer. Will this move improve Google’s products and worsen their competitors’? We’re betting that some device manufacturers are seriously considering their other options in the mobile OS department. The other major event of the week comes from HP. They’ve announced what amounts to a radical shift in their focus as a company. For one, the TouchPad and webOS are both being discontinued. While HP claims they will continue to allow apps to be added to the webOS app store, there will be no more software updates and no new hardware using the OS. Additionally, HP, the single largest computer manufacturer in the world, announced the possibility of spinning off its consumer computing business. We discuss the possibilities ahead for their new direction, and how this could change the consumer computing landscape. Our main topic for this episode is Owning Your Data. With the proliferation of server-side content services (e.g. Amazon Cloud Drive, Google Music, Delicious Bookmarks), we consider it unsafe to treat these services as sole-source backup solutions. We cite examples of disaster due to loss of account access, the service closing its doors, or suffering its own disaster. Our Question of the Week is “Why doesn’t the red dot shut down the program?”, asked by Andrew Warner on August 10. We discuss the reasoning, implementation, and comparison of this feature that has existed for all of Mac OS X’s life. Our Apps of the Week revolve around music! Kyle picks AudioGalaxy, a utility that runs on your computer and let’s you stream music stored on your computer to any other computer or Smart Phone connected to the internet. AudioGalaxy is currently free, including it’s iOS client. Jason picks iScrobble, a utility used to submit your music listening history from your iOS device to Last.fm. iScrobble has a free version, called “iScrobble Pick and Mix” (ads and limited functionality, upgradable via in-app purchases), or $6 for “iScrobble Premium” with all features up-front and no ads. Nathan picks I Love Stars, a menu bar app used save time when you want to rate the song you’re currently listening to, without having to open the iTunes interface. I Love Stars is available for $1 on the Mac App Store. This episode was recorded on Saturday, August 21st. You can subscribe to this podcast via RSS or iTunes. We welcome any feedback, so please leave a comment on this post or e-mail us at podcast@askdifferent.net.